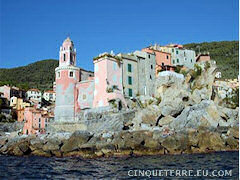 Lerici is situated in a picturesque inlet of the Bay of Poets south of La Spezia at the Ligurian Riviera. This small town is called the Perla del Golfo (the pearl of the gulf), because of its breathtaking beauty. The area around the Gulf of Poets attracted many writers in the early 19th century and the English poet Lord Byron spent some of his life here. 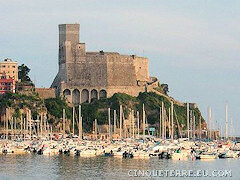 Today Lerici is a charming seaside resort with a small tourist marina. It still preserves traces of its historic past, like the imposing Pisan-Genoese Castle. The town has a small historic quarter and the crescent-shaped piazza with its wave tiles is a pleasant place to sit. The two public beaches in Lerici are lovely and there is a large port. You will find several hotels and seafood restaurants in the neighborhood. • The Palio del Golfo, a rowing contest held in La Spezia on the first Sunday of August every year. The sport competition is preceded by parades, events and shows and finishes late in the evening with fireworks.